When the weather in NYC has turned (for the warmer), and the early morning sun is glowing, and the streets are in full bloom, waking up early to hit the farmers market becomes a ritual. A custom I look forward to all week. This weekend, I brought home an abundance of beautiful vegetables, all bright colored and so fragrant. And, walking home hand in hand, Ascanio and I were contemplating what delicious meals we could prepare for the following week. Roasted rainbow carrots with drizzled curried yogurt and sprinkled with pistachios. Miso glazed eggplant with sesame seeds, sake and mirin. Or, a light farrow salad with carrot ribbons and radish rounds. YUM. But, almost simultaneously, we concluded that rather than roasting, boiling or frying our prized produce, why not… eat them raw? Crudité, we thought. And no, we weren’t considering the average celery, broccoli, cauliflower and carrots served alongside a store bought ranch dressing. We were both imagining our latest obsession. 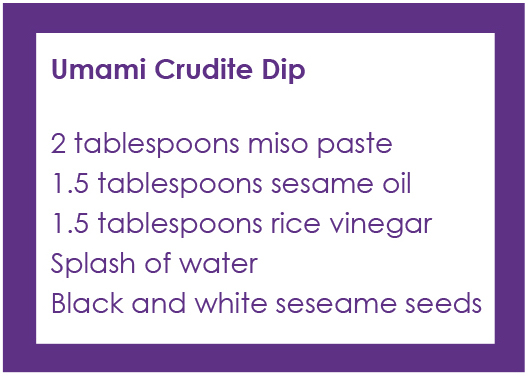 A dip laced with satiating umami flavors. A dip, that has changed our crudité platter, for the better. Mix all the ingredients (with the exception of the sesame seeds) together in a bowl until smooth. If the mixture is too thick, add a splash of water. Sprinkle sesame seeds and serve alongside heirloom rainbow carrots, organic romanesco cauliflower, leaves of Tuscan kale and purple Bravo radishes. It’s so incredibly easy and unbelievably good. When I first made the dressing, I was even impressed with myself, and how easy and simple it was! FYI – this recipe is not only full of flavor, but contains a lot of sodium as well. I know it may be hard to control, but please don’t over indulge!